Bring you own bottles of any liquor you want!! COST: $25 Entry fee, per person- includes $10 “betting bucks” and food! OR visit the PayPal link here. 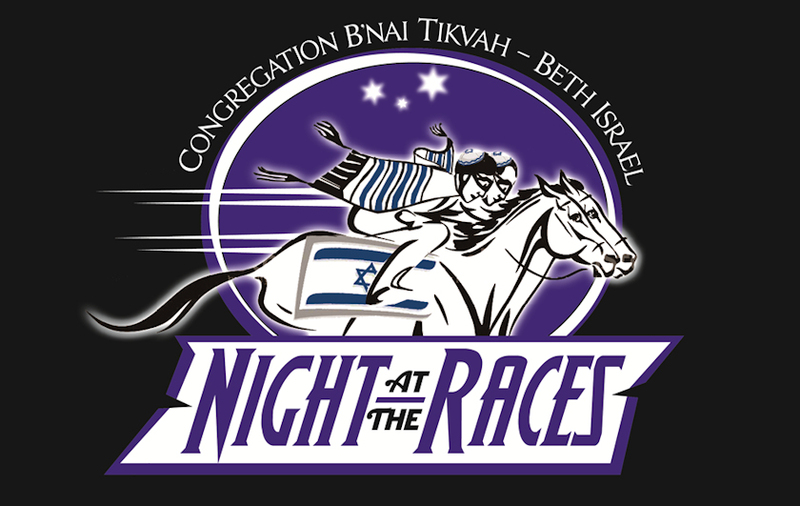 When you get to our synagogue PayPal link, choose “other” on the drop down menu, and in the Directions box, put in Night at the Races. In addition, you will STILL need to fill out the form on our flyer and mail that in, so we know what monies you are contributing. DEADLINE TO ENTER- January 10, 2018 – Don’t wait!! See you there!! You place your bet with the cashier. You get to cheer on the horse you bet on OR even the horse you get to name (see below). You buy “betting bucks” in $10 increments for the races. If you win a race, you collect your winnings at our bank. You then redeem your betting bucks for Raffle tickets for a chance of over 20 amazing gift baskets. You can also purchase raffle tickets. It’s a great way to spend a night with friends and family. BUY A HORSE– for $20 you can “buy” a horse and name it. PRE-RACE SPECIAL– buy 3 horses, pay $50!! BONUS– for each horse you buy, you get an “owner’s” ticket entered in the special Owner’s Circle Raffle. Cheer on your horse named for your child or parent or favorite pet! Race Announcer: And coming around the turn, it’s #6 Donna’s Blocher, leading the pack! All named horses before race night will have their names listed in the program. You still need to place a bet on your horse! SPONSOR A RACE– for $150 you can sponsor an entire race. There are 10 races. COMBO SPONSORSHIP AND HORSE NAMING– for $300, you get to sponsor a race AND name all 10 horses in that race! What a great opportunity to get all your grandkids or friends names in a horse race! Looking to take home a special basket? 50/50– Yes, there will be a 50/50 raffle featuring Paul’s long arm!! TRIVIA QUIZZES– Throughout the night, there will be ongoing trivia quizzes. PUT YOUR HATTITUDE ON– come in your Best Derby hat- for men and women- think of the outrageous hats worn at the Kentucky Derby. Prizes/raffle tickets will be given for the Best Men’s and Women’s hats. Steve Blocher, 260 Night Hawk Circle, Thorofare, NJ 08086. Whether you sign up with a check or through PayPal, please return the tear-off sheet to her… we need the data for the Races Program. Please FORWARD this URL address to your friends so THEY can sign up too … https://www.cbtbi.org/wp-content/uploads/2017/11/Flyer-with-Tear-off-Sheet-legal.pdf to your friends so THEY can sign up too! Ron Cohen roncohen1@comcast.net (856.374.1780) or Donna Blocher dib4ed@gmail.com (856.251.0934).